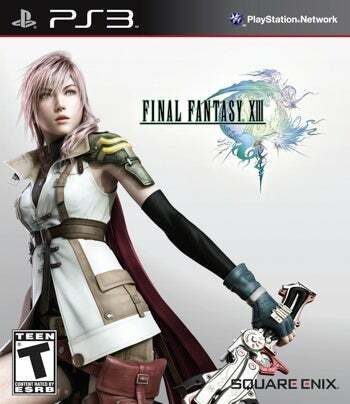 I couldn't care less about game box art, but since it's Final Fantasy XIII, and that's the game I'm looking forward to most in 2010, I'll shill for Square Enix and post the US box covers. That's Lightning, in case you're wondering. 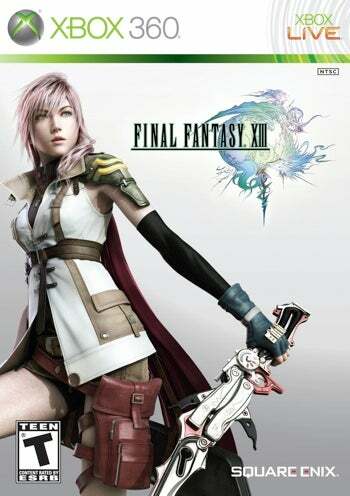 She's the game's intentionally gender-ambiguous (in terms of her facial features, that is) primary protagonist, reportedly designed to resemble Cloud Strife (Final Fantasy VII's tetchy lead) if he suddenly elected to comb his pronged blonde coif forward and dye it something like pale rose or salmon color. Flat-earthers...I mean PS3 fanatics who still think the game's multi-platform release is just a ruse, take note: There's an Xbox 360 boxshot, too. Yes, the game really is poised to launch on both systems next March. Will there be a collector's edition? Not announced yet, but it stands to reason. There was for Final Fantasy XII, and you'll pay dearly for a mint-condition copy three years on, suggesting it sold well enough (and remains in-demand enough) to warrant another. Now that I've shilled, I'll take a moment to proffer a few humble requests: Final Fantasy VIII and IX released in the US for the PSP, and Final Fantasy V and VI ported either to the DSi or PSP. You pick. What do you say, Square Enix?